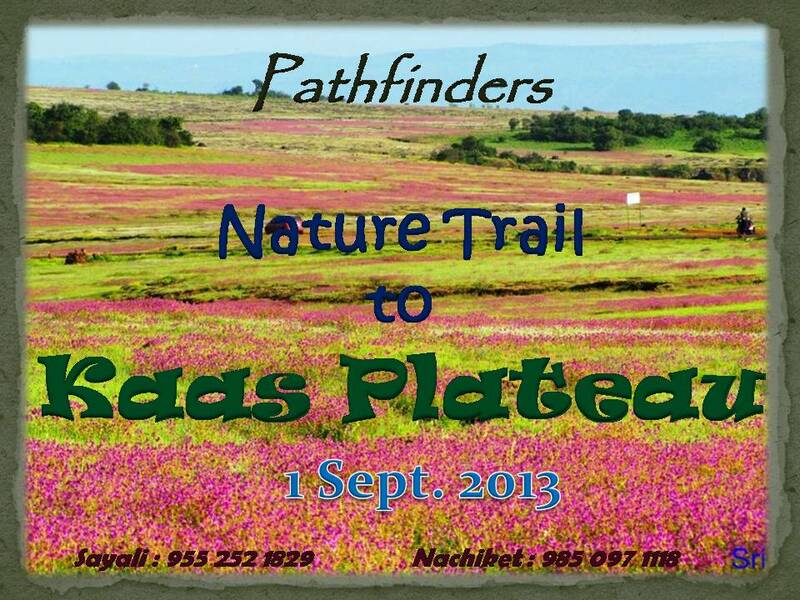 Pathfinders invites you to the tour to ‘KAAS Plateau’ at Satara on 1st Sept 2013. Kaas is a plateau of flowers located 26 km away from Satara. Recently this site is declared as a world heritage site due to excellent biodiversity present over here. Apart from numerous varieties of wild flowers (some of which are endemic to Kaas only) this biodiversity site also shelters many insects, beautiful birds, amphibians, reptiles and some major mammalian species. Visiting this heaven on earth is always an outstanding experience. In monsoon the whole area transforms into an unbelievable carpets of flowers like yellow carpets of Smithia and Sonki flowers, Pink carpets of Balsam, Purple carpets of Karvi etc…. It is a dream destination not only for avid botanists but also for those who appreciate nature. These carpets change colors almost every week depending on the dominant flowers during that time. Kass plateau and the surrounding area has a very good birdlife with good sightings of Crested Buntings, Malabar Crested Larks, Oriental White-eyes, and Bonelli’s Eagle. 5:30am :- Assemble at Durvankur, Tilak Road. 09:30am:- Reach Kaas and Explore the area. Entries and seating arrangement in the bus on first come first served basis. One needs to deposit full payment into the following bank account to confirm his/her registration. Participants are requested to carry the waste back to the city and dispose it off in dustbins. Participants should not deface or damage any monument by writing or scribbling on them. Please help us to conserve and preserve our heritage along with our trek mates. It is of utmost importance that all participants stick together in the group, in the event of any ‘deviation’ by the participant without the consent of the ‘Trek Leader’, he/she/they will be considered as ‘Independent/s’ and will no longer be considered as a part of the group. Each member will be responsible for his/her own safety and baggage. Pathfinders shall not be responsible in any manner for the same and no claims of the participants, parents, guardians, relatives or friends of participants will be entertained. Adventure activity is arranged considering normal weather. In case of occurrence of any natural calamities, if event is cancelled, in such circumstances NO REFUND will be provided.